Michelle Possum Nungurrayi, b. 1970 Mt Allan, Anmatyerre artist, sister to Gabriella Possum, paints Women’s Dreamings from her clan homelands. Anmatyerre artist Michelle Possum Nungurrayi was born in 1970 at Mt Allan, a station community about 250 kms to the north west of Alice Springs. Michelle comes from a well-established artistic family. She is the younger sister of artist Gabriella Possum and their father, Clifford Possum Tjapaltjarri (1932-2002), was one of the founding figures of the Desert Art movement at Papunya. Michelle, along with her sister Gabriella and brother Lionel, was taught to paint by her famous father. Michelle began painting at an early age and produced her first canvases while still a teenager in the mid 1980s. 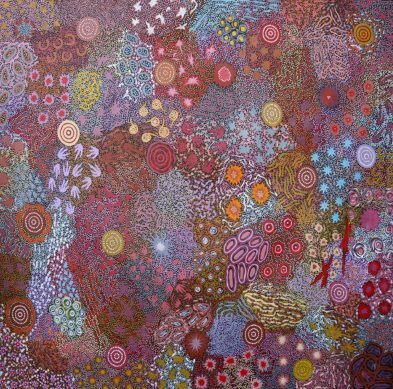 The Dreamings that Michelle Possum paints come from Yuelamu on her home country at Mt Allan. These include the stories of Seven Sisters Dreaming, Bush Tucker stories including Seed Dreaming, Bush Coconut, Fire Dreaming, Goanna Dreaming, and Grandmother’s Country, many of which she combines together in complex interwoven designs. Mainly depicting the overview of maps of traditional Country from her family lands, Michelle describes the many important cultural sites she knows well. Her paintings have gained wide popularity partly due to the fact that as we come to understand the iconography, the paintings make fascinating narratives for a western audience. They are populated not only with plants and food resources and waterholes, but also with people sitting in the landscape – men with hunting implements and women with digging sticks and coolamons. The first exhibition for Michelle Possum was a family group show in 1987 in Brisbane, and her works were exhibited alongside those of her father and her sister Gabriella. Michelle currently paints in Melbourne, where her family now lives, and she often paints in the company of her sister. Aboriginal art status – Established artist.